From D*S, "d*s reader laura hale was browsing through her local thrift store when she saw this “lonely little grey train case miserably tossed in a corner”. 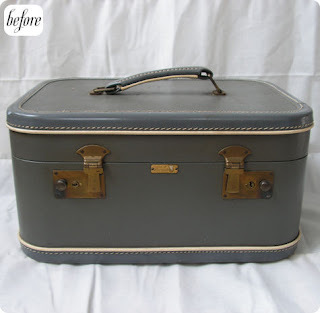 despite being full of dings and stains, laura thought took it home for a little tlc and a handmade makeover. 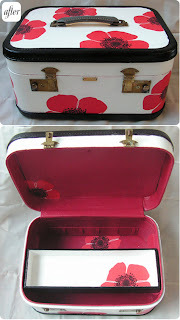 she primed the entire case inside and out, painted the outside fields white, the trim black, and the inside fuchsia, and then decoupaged poppies from her favorite snow & graham wrapping paper onto the interior and exterior. a few coats of poly (to keep it stain resistant) later, it’s now laura’s “favorite thing”"
Check out their site for other fun, unique make overs each day! super cool! I'd really be happy if I had one like that! once I've moved out, I really need to get one! Oh that is flippin' awesome. A great little bag makeover! Oh how fun! Love it! 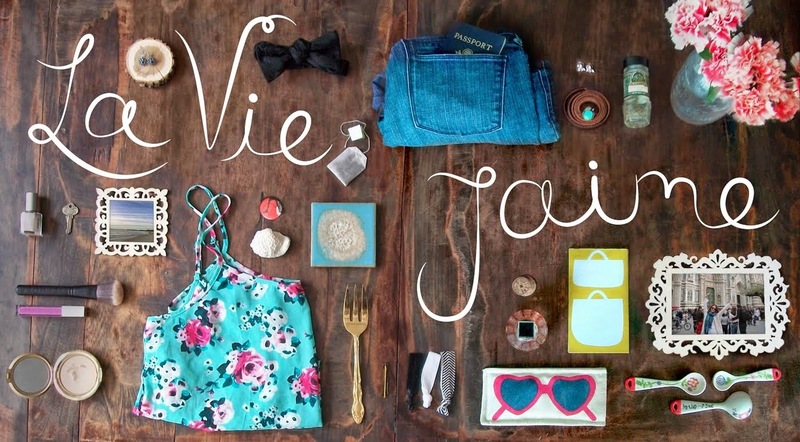 oh, a perfect little weekend getaway bag! thanks for your comment on my Coco+Kelley vacation post today, so happy to have discovered your blog! Now that's DELIGHTFULLY CHARMING and may I also add very PRETTY ! You find such amazing sites - I luv it ! ! !